I had planned to write about our plans for the ground floor of the church. However, we’ve been incredibly busy with all the details of moving in, and I haven’t had much time at an internet-enabled computer. Then the server farm where this blog is hosted had network issues, delaying things further. We also have another meeting with our architect scheduled, so perhaps it is better that I have a chance to get some thoughts together about church conversions in general. All illustrations here point to the source posts, and in most cases there are further photos to be found there. It’s worth clicking! via dezeen.com. 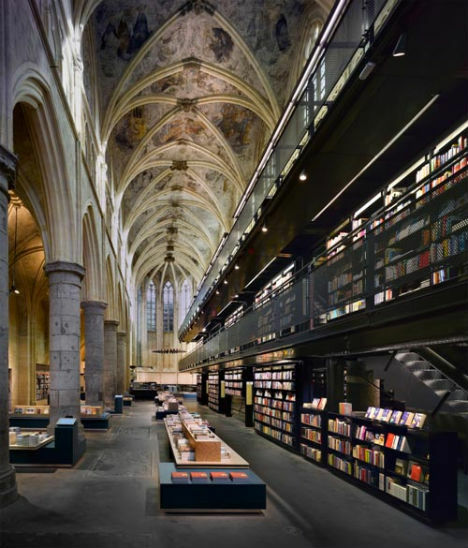 A absolutely wonderful bookstore conversion. I could spend weeks in there and not want to leave. This is, hands down, my absolute favorite church conversion, by a parsec. But, it is not a residential conversion. There is something alluring about the idea of converting a commercial or public building into a residential home. Some might point to the larger-scale architecture that one commonly finds in such projects. However, buildings such as windmills, towers, or potato sheds have small-scale internal dimensions and can be just as attractively transformed. Buildings that need conversion are generally much cheaper to buy than an out-of-the box tract home, thus they are more suited to those who have more time and creative ideas than financial resources. I’d also like to think that since the walls of these buildings have witnessed so much, they’re just more interesting to be around – a lot like people. In some ways, converting non-residential buildings doesn’t significantly differ from renovating and adapting older residential houses (say older than 175 or 200 years). Older houses also usually feature architecture and construction that is unusual today. As with lofts, a major part of adapting older buildings is determining a good place for a kitchen and bathrooms – both not having been common indoors in the main living area two centuries ago, as well as modernizing or installing heating, proper insulation, and so on. Of course, there are always conversion challenges particular to the genre of building. Warehouse converters often have to contend with super-high ceilings and inadequate heating and insulation. Towers can be cramped and have lots of stairs and tiny windows. Prisons have too many little itty-bitty rooms. Bunkers have a window problem. Churches have their own typical problems which are perhaps made more challenging by the generally heterogeneous nature of sacred Christian architecture and the more overbearing nature of the architecture. Most of the other types of buildings I’ve mentioned tend to hail from some particular era, and usually were built with some particular construction type. One early twentieth-century warehouse doesn’t significantly differ from another. A church, on the other hand, might have been built more than 800 years ago, or maybe just last week. Churches span architectural styles and eras, and feature varied construction materials, building types, sizes, numbers of naves, towers, balconies. And that’s leaving aside the different style tendencies of the numerous denominations out there. I’ve collected some pictures of what others have done with their churches conversions, and the variety possible couldn’t be more evident. None of the pictures look even remotely in style like our church, but if you look closely, certain patterns do emerge after all. The major problems are high ceilings, non-obvious room divisions, and finding furniture that harmonizes well with the architecture. Most of the pictures I’ve collected come out of the English-language blog-o-sphere, so there is certainly a preponderance of Anglican, Catholic, and Methodist building styles among them. One aspect that all churches have in common is a main worship hall. This space usually has a high ceiling, and is big enough to house dozens (or if you’re lucky, hundreds) of people. It’s also usually pretty hard to heat economically, since your ceiling waaay up there winds up toasty warm, while your toes and nose are numb from the cold. 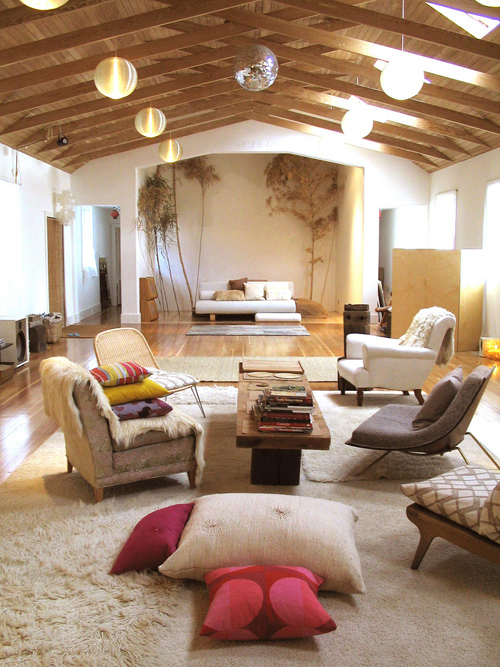 The natural conversion idea is to have the main hall serve as an open plan living room and kitchen. Some churches have the additional problem of a lack of side rooms, so sometimes a bedroom has to be shoehorned in there as well. This of course leads to some problems: how do you contain your cooking odors? Is the bedroom quiet and dark and private enough? 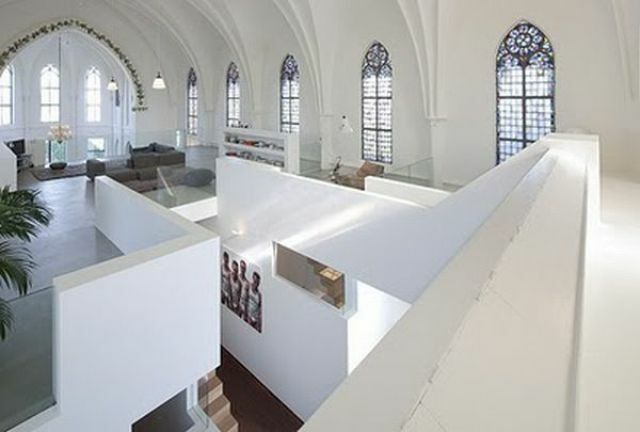 The first example is an award winning church conversion by Zecc Architecture of Utrecht which was linked all over a while ago. They seem to have extended the existing organ loft on one side to provide a covered nook for the kitchen. On top of the kitchen, they situated a small work area. via Zecc Architecture. 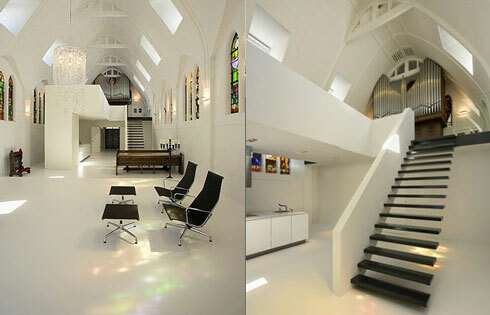 A well photographed chapel conversion in Utrecht. Unusually, the space is cut lengthwise. Click on the picture to see more images from the same church on Zecc's website. via Zecc architecture. View from under the gallery. Click on the pic to see outside shots and a before picture. 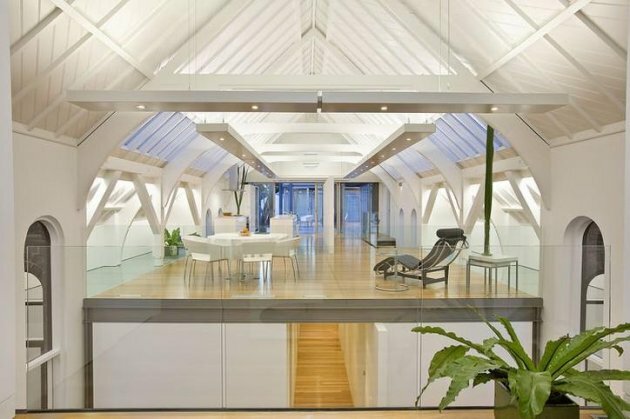 The solution is very much like the typical warehouse or barn loft conversion where box constructions inside a large cavernous area supply various private spaces. 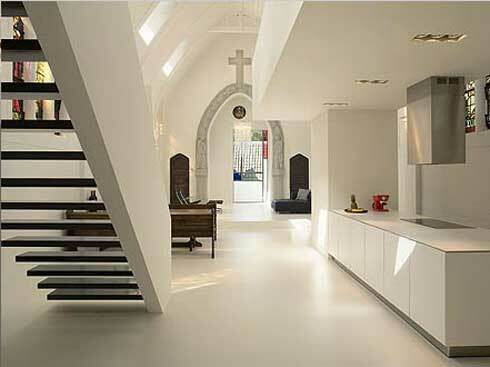 Zecc used this approach for another Utrecht church conversion to a greater degree. via izismile. Click to see more pics. Here the architects plonked down a field of boxes to divide the space. Another example is the Toxteth Church in Sydney, transformed by Otto Cserhalmi + Partners. 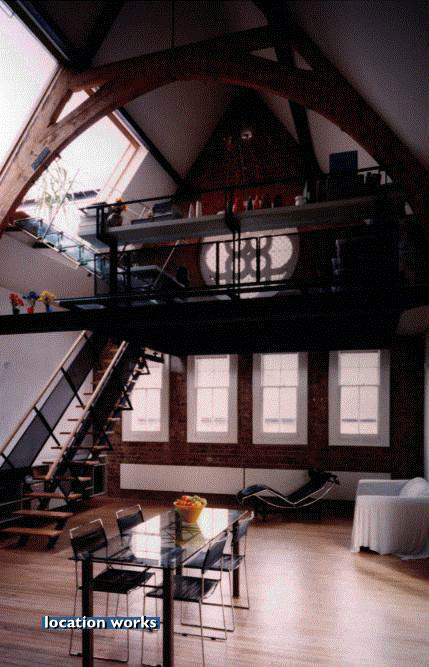 The architects built a complete second floor into the previously derelict building. Unusually, the kitchen and living areas are on top of the platform, with bedrooms (presumably) underneath. In addition, they build an entirely glazed, two-story addition to the building. via Lofty Lovin. The architects added a complete second floor to this church interior, but they made it look lighter by using a lot of glass. While this approach works naturally in a barn or warehouse setting where one expects to see boxes or bales of hay, the room-containers, in my eyes, work against the architecture of older churches. Or one could more charitably say that they produce a surprise or contrast to what one expects of a church interior. At least they aren’t blindly imitative. As cool as these church homes look, I think we’re aiming for a conversion that feels a bit more organic to the existing building. The architecture in our church might well be modern enough that boxes or pods wouldn’t look out of place, however the modest size of the worship hall wouldn’t accommodate pods and still feel big and airy. via plushpalate. A large three nave church conversion. Here the kitchen was placed where the altar used to be. Many conversions mitigate the overbearing “churchiness” by white-washing the entire interior. While the effect achieved is often quite pleasant, I personally feel rather uneasy about white-washing the interiors of older churches in particular. It reminds me too much of the vandalism of the reformation when zealous protestants obliterated the beautiful polychrome in medieval churches. via ourodesign.com. An example of a stylistically unsuccessful renovation. 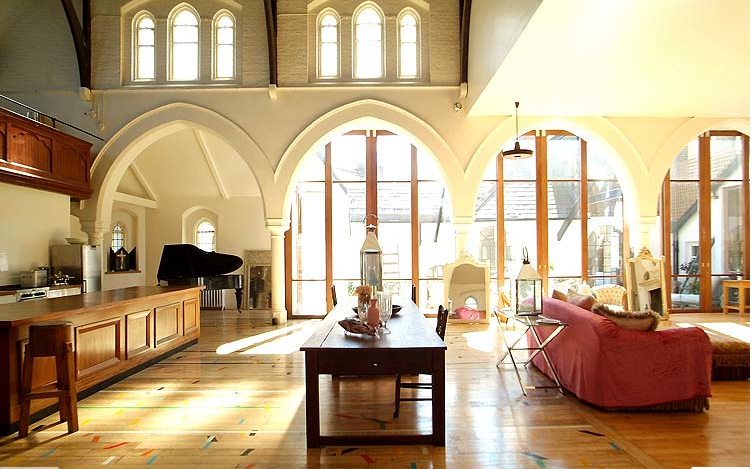 One can find many examples of converted churches where the space has been very gently changes, but where the style choices of the interior designers or owners just don’t gel completely. Either the furniture tends toward the industrial, which looks out of place in a church, or just doesn’t work for other reasons. via Location Works. A very pretty building, gently converted. And filled with some truly heinous furniture. The conversions that I find the most attractive respect the architecture and style of the church without being too precious about it. The following is an example of this, as is the bookstore this post started with. The conversion style is modern, but it doesn’t destroy the existing beautiful architecture, nor do the furnishing and decoration look alien to the building. via ounodesign. 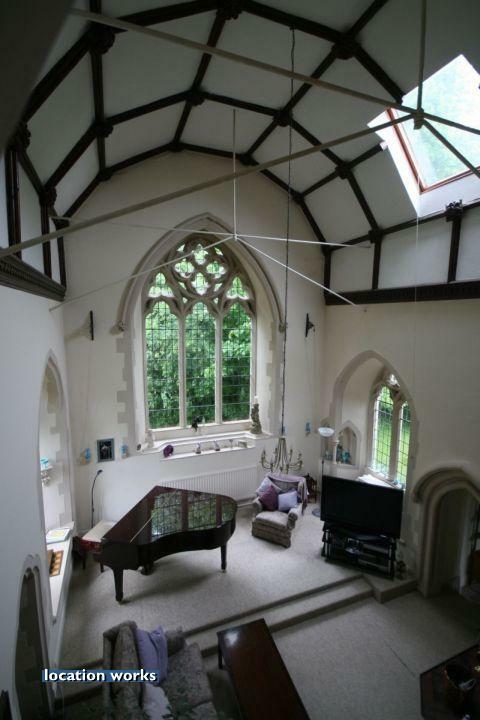 A nicely converted rustic-type chapel. I’ll close with a few other links to church conversions that I’ve collected on the web. © 2011 – 2012, Converting a Church. All rights reserved. Hey There. I discovered your blog using msn. That is a really neatly written article. I will be sure to bookmark it and come back to learn more of your helpful information. Thanks for the post. I will definitely comeback. About the author, this blog, and our church. Together with my spouse, I bought a redundant church in a somewhat randomly chosen spot in Germany in early 2011 and we are working on making it habitable - and fabulous. This blog is an account of our conversion adventures. I've also developed quite an enthusiasm for church conversions, and church architecture in general. The building was built by the New Apostolic Church in the 1970s. It has lots of fundamental architectural features in common with gothic chapels (soaring ceiling, single nave, huge pointed windows, layout, etc. ), but expressed using a modernist/post-modernist architectural vocabulary. I love comments, so please do say hello! Converting a Church uses Graphene theme by Syahir Hakim.